Registration for Adult Sailing, Weekend Racing, Tennis, and Social Events is coming soon! Check out this great summer job opportunity by clicking here! The Stony Lake Yacht Club is accepting applications for the position of Junior Tennis Pro for the 2019 tennis season (July and August). The Junior Tennis Pro will work in conjunction with the Head Tennis Pro and Assistant Head Pro, along with the SLYC Tennis Director, to provide on court instruction to players of all skill levels. The Junior Tennis Pro is responsible for the youngest players and their overall safety and enjoyment, along with assisting the Head Pro in adult clinics when necessary. Please submit all resumes, with references, to carriescace@rogers.com by February 28, 2019. If you would like to become a SLYC Junior Sailing Race Coach for the 2019 season we would like to hear from you. The program will run from July 1 to August 23 2019, with training and set up in late June and teardown immediately following the end of lessons. Applicants should have or be committed to getting appropriate instructor qualifications and must recognize that travel to off lake regattas and coaching weekends while off lake are a part of this rewarding job. Advanced instructor qualifications are of strong interest. Applications should be sent to Owen David, Director of Junior Sailing at juniorsailingdirector@gmail.com by December 15, 2018. Please indicate SLYC Race Coach Application in the address line. Your application should include a resume, including a detailed outline of your sailing/teaching qualifications and achievements as well as your race coaching experience and personal racing experience. Your covering letter should indicate why you feel you would be a good race coach and some of your ideas on how you will provide the best experience for our race team. For applicants interested in race coach positions, telephone interviews will be scheduled shortly after the application deadline and appointments will be made in early January. If you would like to become a SLYC Junior Sailing Instructor for the 2019 season we would like to hear from you. The program will run from July 1 to August 23 2019, with training and set up in late June and teardown immediately following the end of lessons. Applicants should have or be committed to getting appropriate instructor qualifications. While prior experience teaching at SLYC and advanced instructor qualifications are of strong interest, we welcome applications from new instructors as well. Applications should be sent to Owen David, Director of Junior Sailing at juniorsailingdirector@gmail.com by December 31, 2018. Please indicate SLYC Sailing Instructor in the address line. Your application should include a resume (including a detailed outline of your sailing/teaching qualifications and achievements) and a covering letter. Your covering letter should indicate why you feel you would be a good instructor and some of your ideas on how you will provide the best experience for our students. For new applicants who have not previously taught in the program and those interested in race coach positions, telephone interviews will be scheduled shortly after the application deadline and appointments will be made by the end of January. Congratulations to our own Gord Welsh who finished second overall in the Standard Apprentice Class at the 2018 Laser Masters World Championships in Dun Laoghaire, Ireland! By all measures, the Cottage Club Regatta, hosted by SLYC, was a huge success! Our sailors won gold (and lots of silver and bronze) in four of the five fleets, resulting an overall first place finish for SLYC. Congratulations to all CC sailors, coaches and members of the support team – what a great way to showcase the results of the hard work you’ve put in to develop your sailing skills and race strategy. Cottage Club was a success off the water as well. We met our goal of reducing waste by eliminating plastic water bottles, recycling paper, plastics and organic waste, and were left with two bags of garbage, which was a large task given that we fed and entertained more than 90 sailors and 20 coaches over two full days! We recruited more than 25 eager SLYC volunteers who helped with everything from making sandwiches to directing traffic flow as trailers arrived at and departed from Carveth’s (a big thank you to Randy and his crew for the generous support they provided). 21 families opened their cottages to host 60 billets and gave our visitors a taste of life at Stony Lake. One of our instructors stated that he has been involved in 6 Cottage Club Regattas as a sailor and coach and he thought this was the best one he had been attended. Thank you to the Cottage Club Organizing Committee of Susan Fisher, Cynthia Goodlchild, Scott and Kara Walsworth, Colin Kinnear, David Hahn, Jen Rishor, and Sarah David. A big thanks also does to the Junior Sailing instructors who, organized, coached, billeted, ran the race committee and scored the event. Lastly an enormous thank you to all who volunteered for this amazing event. You are the heart and soul of this community based regatta! Wow!!!! It does take a team to get this group to the start line. Thanks to all of the host billets and volunteers for supporting this fantastic event. 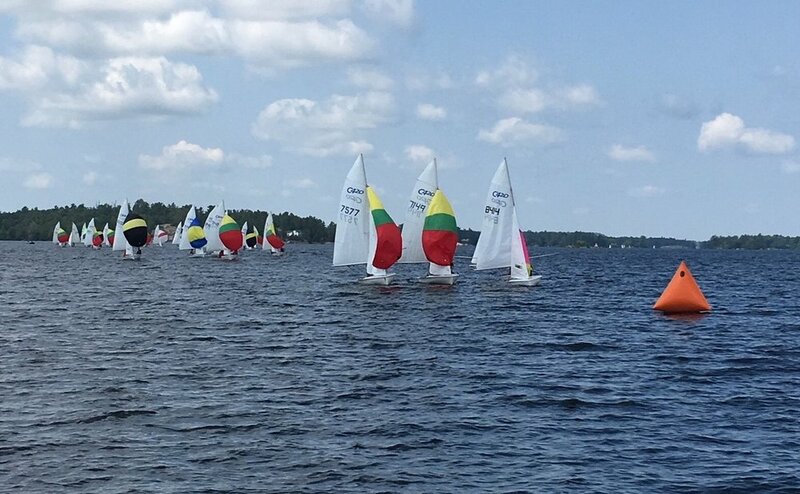 Congratulations to SLYC/ RCYC sailor Tom Ramshaw for his 5th place result out of a fleet of 90 of the world’s best Finn sailors representing 42 nations at the Finn Gold Cup and World Sailing Championships event in Aarhus Denmark. This result is a season best result at the world level for Tom and marks Canada’s best result across all fleets at these World Championships. The regatta saw a variety of sailing conditions including a gusty Race 10 with winds reaching 35 knots. The Finn regatta concluded Thursday August 9th with the top ten sailors participating in the Medal race. With Tom’s success in Aarhus, he attained his goal and has procured for Canada one of the first 8 spots allocated in the Finn class at the 2020 Tokyo Olympics. Scott Wootton is completing his first year as Commodore. Commodore is a one-year term and must be voted upon annually by the membership. If approved by a resolution at the 2018 AGM, John Heine will continue as Past Commodore. The Board welcomes nominations to the Board from membership. The Board can have up to 14 Directors. Selected nominees will be appointed to specific Directorships by the Board. Those not selected for a Board role this year will be considered for non-Board roles and Committee roles as well as future Board roles. We appreciate all volunteers. Please forward nominations to John Heine (heinej@shaw.ca), Scott Wootton (scott@kawarthalakesconstruction.com), Michele MacPherson (michele2100@gmail.com), or Tam Matthews (tmatthews@wpga.ca). Please join us on Juniper Island for the Annual General Meeting of the Stony Lake Yacht Club on Saturday, August 18, 2018 at 2:00pm upstairs in the SLYC Clubhouse. The 2018 SLYC Golf Tournament is SOLD OUT! Cottage Club Regatta Registration is now live! New Junior Sailing Calendar! Check out the link on the Junior Sailing webpage. The Stoney Lake Sprint is back! Saturday July 14, 9:00am at Viamede. 1K and 5K. Register for the 1st Annual STONY SLAM! Tennis fun on June 30! Bring your cottage spirit and love for tennis and join us for the 1st annual Stony Slam on Saturday, June 30! Six teams of six players will vie for the title of Best on Lake, followed by a chance to toast and roast each other at SLYC’s season opening cocktail party. All levels of play are welcome as teams will be seeded and the emphasis is on fun! Registration opens Thursday, June 7 through the MindBody system: https://clients.mindbodyonline.com/classic/mainclass or through the SLYC website www.slyc.ca. Please note that your yacht club + tennis membership must be up-to-date in order to register. Participant cap is 36 players so register early! Cost is $30 per player which includes an exclusive, special edition Stony Slam Nike dri-FIT cap. We can’t wait to welcome you to another awesome season of Stony Lake tennis! Please help us out with our season planning and register your juniors for tennis classes as soon as possible. We have a great summer planned for our young players and our team is ready to teach some skills and have lots of fun on court! If you have any questions at all, don’t hesitate to reach out to me at carriescace@rogers.com. I’m always happy to talk tennis!